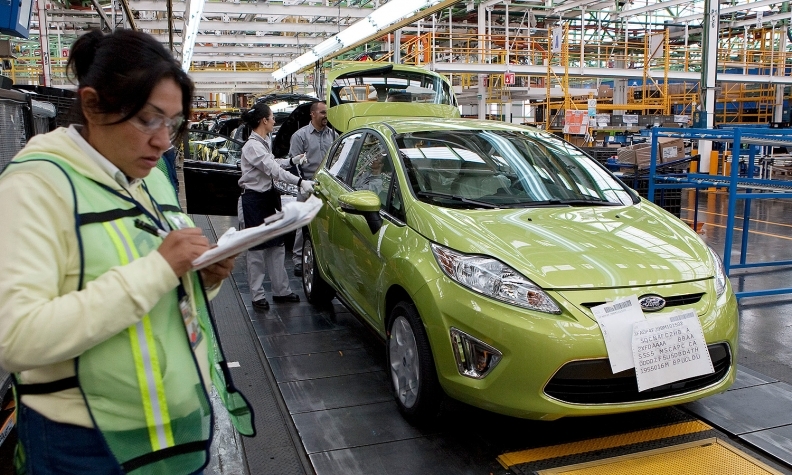 A Ford assembly plant in Mexico. Peter Welch, president of the National Automobile Dealers Association, says U.S. customers would “revolt” if dealers tried to pass along price increases related to a border tax. Editor's note: This report has been clarified to reflect the Association of Global Automakers' stand on the U.S. House of Representatives' blueprint for tax reform. NEW YORK -- Trade barriers seem to be off the front burner for the Trump administration lately, but analysts and industry executives at the NADA/J.D. Power Automotive Forum in New York on Tuesday warned against getting complacent. “I’m from the school of politics that it’s never dead until it’s actually dead,” said John Bozzella, president of the Association of Global Automakers, talking about the idea of a border adjustment tax on goods crossing the border from Mexico. The trade group opposes the U.S. House of Representatives' blueprint for tax reform. Trump, others in his administration and even Speaker of the House Paul Ryan have also said the border tax would also apply to goods coming from Canada. About 85 per cent of the roughly 2.1 million vehicles assembled in Canada are shipped to the United States every year. Peter Welch, president of the National Automobile Dealers Association, said customers would “revolt” if dealers tried to pass along price increases related to a border tax. “Our customers are incredibly price sensitive -- US $1,700 is one number I’ve read. If that actually trickles down to the hood of a car, we would see an economic calamity the likes of which we’ve never seen before,” he said. Mitch Bainwol, CEO of the Alliance of Automobile Manufacturers, said in the same panel discussion that he thought the border tax has “less than 50-50” chances of passing. He hinted the chances could be lower. “I’m trying to come up with a number that’s least likely to create news,” he said. Behravesh said populism could cut either way, depending whether the Trump administration emphasizes protectionist populism, or pro-growth populism. Protectionist populism would hurt the industry and even could trigger a recession, Behravesh said, although he said he thinks that’s unlikely. “The upside is, a pro-growth agenda could be really good,” he said.